在尊嚴和權利上一律平等。 and equal in dignity and rights. 並應以兄弟關係的精神相對待。 and should act towards one another in a spirit of brotherhood. ^ Only p m d n g c a e ê ü (from p m d n k j ä è dropped-e ü) approximate the French norm. Other letters have been reassigned so that the sets of letters in groups such as d t n l and g k h are similar in shape. ^ 國語點字自學手冊, National Taiwan Library, retrieved on April 18, 2016. ^ [sic] One might expect ㄐ j (/tɕ/) to pair with ㄗ z (/ts/), by analogy with the others. 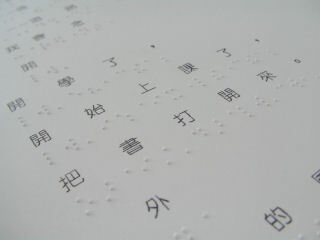 Compare here, where the character 學 xué is rendered ⠑⠦⠂ "süé". Historically it could have been either. The principal behind the assignments seems to be that, of the historically appropriate pairs of letters g~z, k~c, and h~s, the letter with the fewer dots is used for j, q, x.